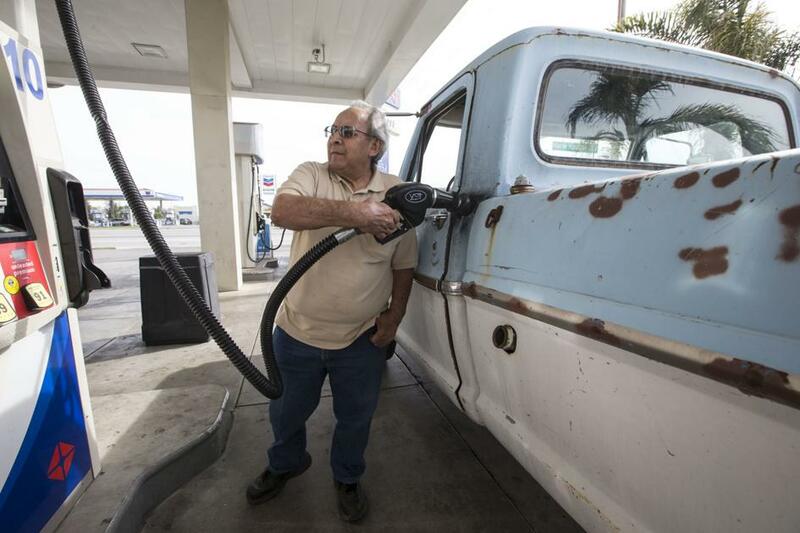 New uncertainty overtook California gasoline prices Monday as a sudden jump in oil prices overshadowed reports that some of the state’s largest refineries may soon come back online, likely increasing the state’s fuel supply. It was unclear whether the net result will be further price increases or a decline after a month in which pump prices rose by 19 percent. At least one observer, with the California Energy Commission, said he thinks prices will keep going up. “I would say a lot of the signs are pointing up as opposed to down,” said Ryan Eggers, the agency’s supervisor of transportation fuels data. Oil prices jumped to their highest level in six months after the Trump administration announced it will no longer allow China, India and other countries to violate international sanctions on the purchase of Iranian oil. A tougher line by the administration on Iranian oil exports would be expected to crimp the international supply of oil. All else staying the same, that would put upward pressure on oil prices and, by extension, California gasoline prices. Brent crude, the global oil benchmark most Kern County crude prices are pegged to, surged Monday by more than $2 per barrel, or 3 percent. Meanwhile, The Automobile Club of Southern California said there was a “light at the end of the tunnel” with regard to the problems that have hobbled six of the state’s 10 largest refineries during the last several weeks. Auto Club spokesman Jeffrey Spring said Monday at least two of the refinery disruptions appear to have been the result of planned maintenance and that some of that work is expected to end soon. Also, there are reports that tanker shipments of California-blend gasoline is on its way to the Golden State from Europe and could arrive within the next couple of weeks, he said. That would normally have the effect of lowering prices motorists pay at the pump. Bakersfield’s average price for a gallon of unleaded was up only slightly Monday at $4.008 per gallon, the Auto Club reported. That was about 50 cents more than local motorists were paying a year ago. Statewide, the average price for unleaded was $4.031. Until the recent run-up in prices, California hadn’t seen its average gas price top $4 since July of 2014. The national average Monday was $2.842, according to the Auto Club. Spring noted price increases have moderated in recent days. “It’s not climbing as fast as it was last week and the week before that,” he said. But when will the price come down again? “That’s always the big question, isn’t it,” he said, before adding, “this next week or so could be the peak” before prices turn downward. 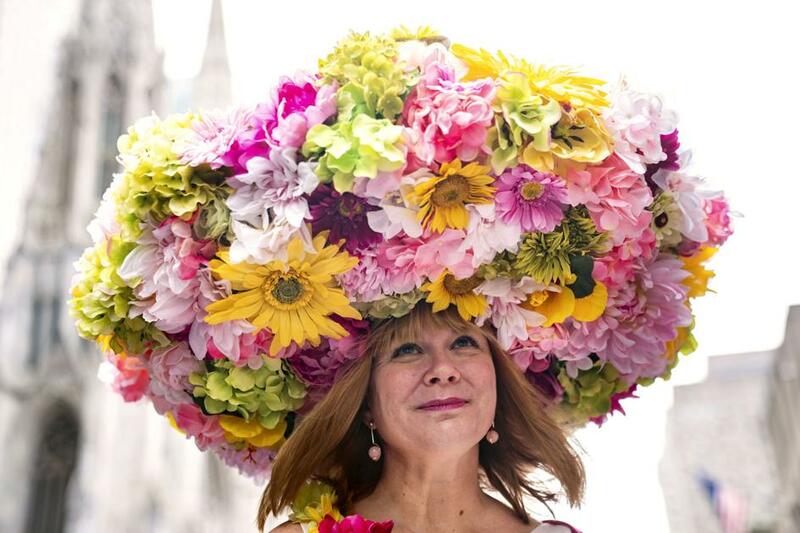 Spring said it was still too soon to know how the administration’s announcement on Iranian sanctions would affect gas prices. Don’t Threaten. Threats of harming another person will not be tolerated. Share with Us. We’d love to hear eyewitness accounts, the history behind an article. 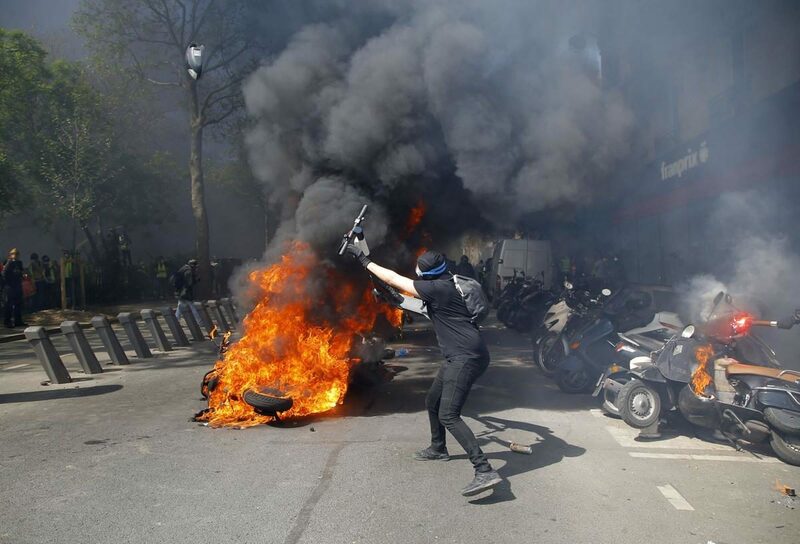 PARIS (AP) — French yellow vest protesters have set fires along a march through Paris to drive home their message to the government that rebuilding the fire-ravaged Notre Dame Cathedral isn’t the only problem France needs to solve. Police fired water cannon and sprayed tear gas to try to control radical elements rampaging on the margins of the largely peaceful march. A protester throws a scooter onto a pile of burning motorbikes Saturday during a yellow vest demonstration in Paris. A man in a yellow vest holds up a sign Saturday at the Place de Republique during a yellow vest demonstration in Paris. Motorbikes are set on fire during a yellow vest demonstration Saturday in Paris. A protester puts his arms in the air Saturday at the Place de Republique during a yellow vest demonstration in Paris. A man dressed as Robinhood waves the French flag Saturday during a yellow vest demonstration in Paris. A man kicks away a tear gas canister Saturday during a yellow vest demonstration in Paris. A protester lights a motorbike on fire during a yellow vest demonstration Saturday in Paris. A man drapes himself in the French flag Saturday during a yellow vest demonstration in Paris. Police scuffle with protesters during a yellow vest demonstration Saturday in Paris. A protester in a yellow vest sits under a banner which reads ‘revolution’ at the Place de Republique, during a yellow vest demonstration Saturday in Paris. A man carries a sign which reads ‘tomorrow the sky will be yellow’ as he walks by a fire burning on the street Saturday during a yellow vest demonstration in Paris. The Young’s Marketplace stores are gone. The Cope’s Foodfair Markets are history, too. East Bakersfield’s last surviving Green Frog Market closed in 2013. And likewise, Modern Way Market on South Chester is no more. Now add Oildale’s 11-C to the ever-lengthening list of mom-and-pop supermarkets that have closed their doors in Kern County. The locally owned mainstay on Roberts Lane drew customers for decades with its full-service meat counter and know-you-by-name friendliness. But on Saturday, the last remaining 11-C will close its doors for good. “At one time, there were five 11-C’s,” said Steve Coleman, one of the managers of the market on Roberts Lane. Besides the Oildale store, there was the original 11-C in Taft, which is believed to have been named after a numbered oil parcel located near the store. Another market in Shafter, and two in Bakersfield, were ultimately added. When the Oildale location closes, 11-C will be no more. “Once they let the Walmarts in, it was only a matter of time,” Coleman said. When you ask customers and store employees about the closing, that W-word almost invariably comes up. The retail powerhouse moved into Oildale in 2014, developing a Walmart Neighborhood Market on North Chester Avenue, which includes meats and groceries. Since then, the nearby Vons on North Chester Avenue in Oildale has closed as has Cope’s on Norris Road — and now 11-C. Two Dollar General chain stores have sprung up north of the river, and a Family Dollar now occupies the former Cope’s location. “What I really have to say about this (closure) you can’t put in the newspaper,” said an angry Charles Bell, who said he shopped at Cope’s before it became extinct, then started coming to 11-C for its meat counter, which has been operated by veteran butcher John Cope since his family’s Cope’s Foodfair closed at the end of 2017. Requests left at the store on Wednesday in an effort to reach owner Brent Cruz did not receive a response. But Cruz showed up during a second visit by a reporter on Friday. When asked to comment on the planned closure, and specifically on how many employees might be affected, Cruz declined. Soon after, he invited the reporter to leave. But even the boss couldn’t stop the wave of emotion that has been felt by some employees and customers as the last day neared. “I cried three times today, my official last day,” said Megan Vanderhorst, who has worked 14 years in the meat department at both Cope’s and 11-C. According to former Bakersfield resident Tracy White, her father, Charlie Holman and his lifelong friend and business partner, Ralph Niblett, opened the 11-C in Taft in 1964. It was named, she said in a Facebook comment, for the Standard Oil parcel across the street from the store. The partners opened the Oildale store in 1971 or ’72, she said. 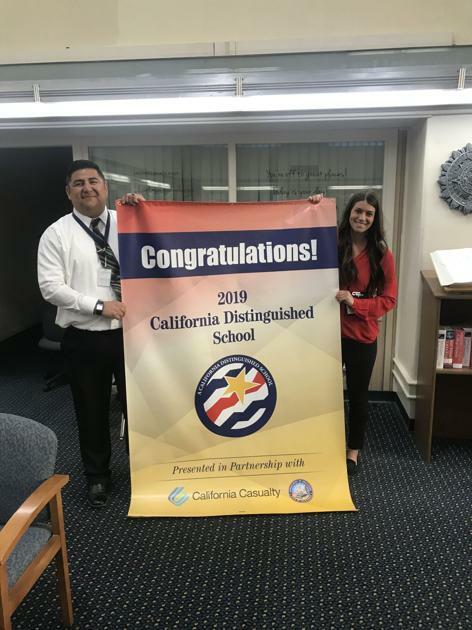 It’s difficult for locally owned markets to compete against huge corporate giants like Walmart, retail consulting firms have told The Californian. Cope, whose family owned a small chain of locally run grocery stores, has worked in the industry since he was a youngster, following his dad into the butcher’s trade. “At the age of 10, I had a knife in my hand,” he said. For years, Cope’s on Norris and 11-C on Roberts, had a friendly competition, Cope said. But when the Norris Road store closed more than a year ago, 11-C brought in John Cope to run its meat counter as a contractor. But Wallmart and other competition north and south of the river was already sending reverberations through the poverty-stricken community. People shop for value. People with reliable transportation are going to shop at Target and Costco and Walmart. A small, family-owned market can’t compete with them on price, Cope said. But those who aren’t able to hop in their car and shop wherever they want could be in serious trouble with the loss of 11-C and Cope’s — and that’s a sizable number in Oildale, where residents walk across the Chester Avenue Bridge in blistering heat just to shop at FoodMaxx. “One of our biggest sellers is our meat baskets,” Cope said. 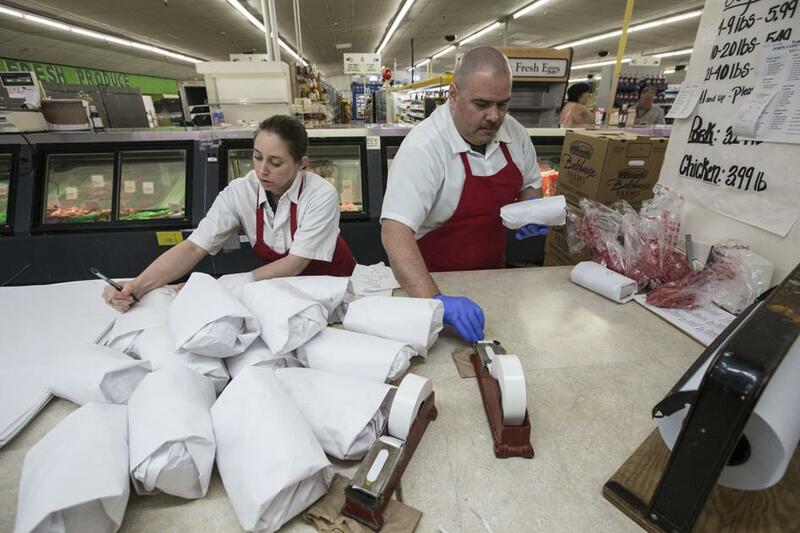 Customers choose from various selections, and stretch the bargain meats over several weeks. “It has to get them through the month,” he said. Partly cloudy. High 93F. Winds WNW at 10 to 20 mph..
A few clouds from time to time. Low 61F. Winds N at 10 to 20 mph. Sen Dog, from left, DJ Muggs, Eric “Bobo” Correa and B-Real, of hip-hop group Cypress Hill, pose atop their new star during a ceremony Thursday at the Hollywood Walk of Fame. B-Real, of hip-hop group Cypress Hill, signs a fan’s Dodgers cap following a ceremony honoring the band with a star on the Hollywood Walk of Fame on Thursday. Sen Dog, from second left, DJ Muggs, Eric “Bobo” Correa and B-Real, of hip-hop group Cypress Hill, pose atop their new star Thursday with Xzibit, left, and George Lopez, right, during a ceremony on the Hollywood Walk of Fame. George Lopez speaks during a ceremony honoring hip-hop group Cypress Hill with a star on the Hollywood Walk of Fame on Thursday. Looking on from right are DJ Muggs, Sen Dog and B-Real of Cypress Hill. B-Real speaks as bandmates, from right, DJ Muggs and Sen Dog, of hip-hop group Cypress Hill, look on during a ceremony honoring them with a star on the Hollywood Walk of Fame on Thursday. Xzibit speaks during a ceremony Thursday honoring hip-hop group Cypress Hill with a star on the Hollywood Walk of Fame. Looking on from right are DJ Muggs and B-Real of Cypress Hill. Prophets of Rage guitarist Tom Morello, center, reacts during a ceremony Thursday honoring hip-hop group Cypress Hill with a star on the Hollywood Walk of Fame. Morello also played in Rage Against the Machine and Audioslave. B-Real, of hip-hop group Cypress Hill, signs an autograph for Hugo Mira, of Los Angeles, following a ceremony Thursday honoring the band with a star on the Hollywood Walk of Fame. 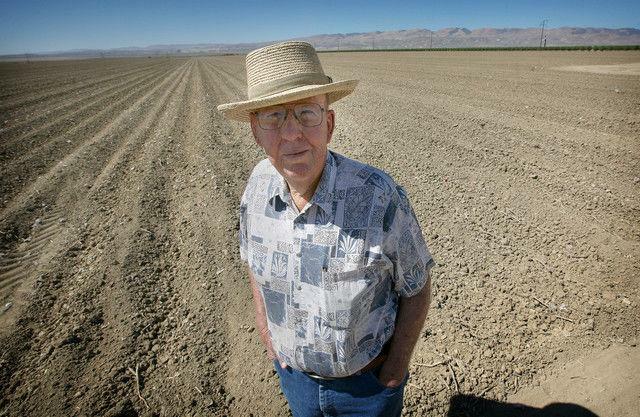 Fred Starrh, a longtime Shafter cotton farmer and industry leader whose landmark legal victory over a Bakersfield oil producer earned him local renown, died Tuesday at the age of 89 after suffering a stroke. Born in Tucson, Ariz., Starrh grew his family’s holdings from 35 acres to several thousand after expanding from planting cotton and alfalfa to growing almonds and pistachios. He held numerous positions on local, industry and national boards. Outside ag circles, he was probably best known for a lawsuit he filed against Aera Energy LLC, a local oil company he was able to show had knowingly allowed its wastewater to contaminate his groundwater. 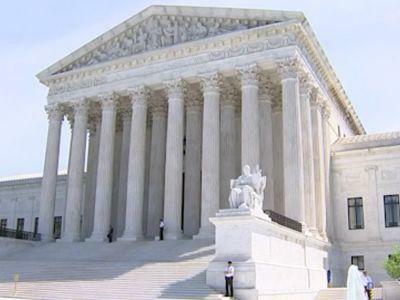 The 13-year case, which was tried three times and appealed twice, included a multimillion-dollar award against Aera. Starrh was a “big-picture kind of thinker” who put service to community and industry above individual gain, his son-in-law Jay Kroeker said. He was also a dedicated family man who sometimes became emotional talking about his family. “Family was the most important thing to him,” Kroeker said. Active in national cotton industry groups, Starrh served on the Kern High School District and the Kern County Farm Bureau, where he served as the local industry group’s 35th president from 1973 to 1975. Among his accomplishments at the bureau were authorization of overweight loads for perishable produce on county roads and establishment of group’s Young Farmers & Ranchers Committee, President Tito Martinez said in a written statement. “The Kern County Farm Bureau sends (its) condolences to the Starrh family, and we are thankful for his years of services, hard work and dedication benefiting the agricultural industry in Kern County,” Martinez wrote. Starrh’s first wife, Nancy, died in 2009. He is survived by his second wife, Linda Colbard, and his son Fred Starrh Jr. and daughters Carol Kroeker and Anne Ashley. He is also survived by his grandchildren Adam Starrh, Dana Starrh, Keith Starrh, Michelle Starrh, Brent Starrh, Brad Kroeker and DeeAnn Edick, as well as two great-grandchildren, Colt and Walker Starrh. A memorial service has been scheduled for April 28 at Shafter Mennonite Brethren Church. Jay Kroeker said Fred Starrh was not a member of that church but that the family wants to host a remembrance there because they’re afraid his church, Shafter Congregational Church, is too small to hold everyone who wants to attend. 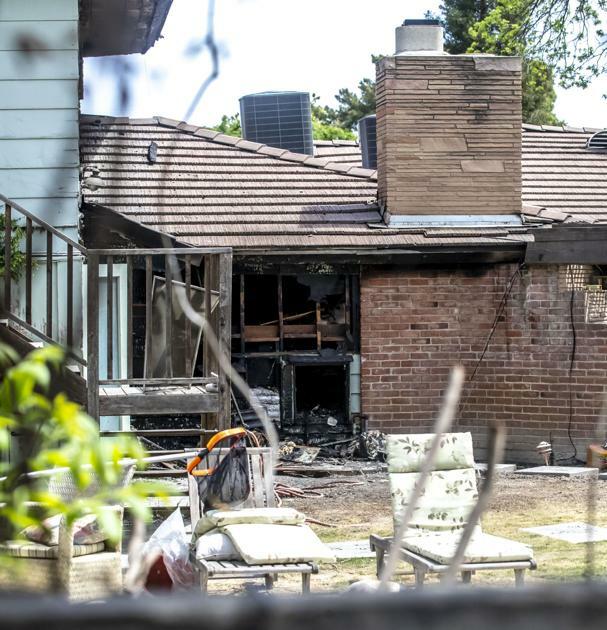 Local attorney Phil Ganong has confirmed to a Bakersfield television station that his son died in a fire on Saturday. Ganong reportedly told KGET that his son, William Ganong, 35, died after a fire broke out at a residence on Beech St. just after midnight. The Kern County Coroner’s Office has yet to confirm the identity of the man that passed away. In a report released Monday, the department said it would withhold the identity pending positive identification and notification of next of kin. A report by the Bakersfield Fire Department said five people were in the home when the fire broke out. Crews reportedly arrived to find the home fully engulfed in flames. Phil Ganong has represented marijuana interests in Kern County for many years, and has fought efforts by the county to ban medical marijuana sales. “There’s romance in those planes,” said Dr. John Close, a retired physician who was there with his wife, Susan, to see the World War II-era warbirds. Indeed, as they lined up on the tarmac, the planes almost seemed like time machines, not just war machines — here to carry enthusiasts back to another era in the nation’s history. It’s all part of the Collings Foundation’s Wings of Freedom Tour, a nearly three-day educational stopover in Bakersfield that includes a B-17 Flying Fortress, a B-24J Liberator nicknamed “Witchcraft,” a B-25 Mitchell medium bomber and a Curtiss P-40 Warhawk, a plane made famous by the Flying Tigers, a group of American volunteer pilots who worked within the Chinese Air Force before Pearl Harbor officially brought America into the war. A fifth plane, a P-51 Mustang, had been expected, but organizers said Monday it may arrive Tuesday, or more likely will have to be scratched from the lineup. 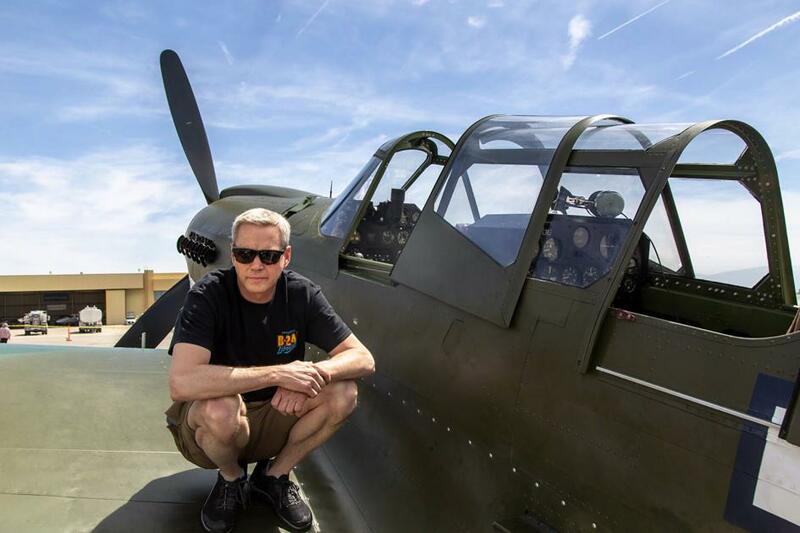 “Fighters are a little bit more fussy,” said Mark Murphy, a pilot who flew the P-40 into Bakersfield. Murphy had a Monday afternoon appointment already in place to take a paying guest up in the P-40, which isn’t normally a two-seater. However, about 30 of the fighters were modified for instructional purposes, he said, and the nonprofit foundation was lucky enough to get one of them. Visitors are invited to explore the aircraft inside and out — $15 for adults and $5 for children under 12 provides access to up-close viewing and tours through the inside of the larger planes. Ted Arbolante, of Bear Valley Springs, drove into Bakersfield on Monday for a chance to experience the vintage aircraft. “Oh, I love planes. I’ve been to Lemoore (Naval Air Station), China Lake (Naval Air Weapons Center) and Edwards Air Force Base,” he said. He can see test flights of Virgin Galactic’s SpaceShipTwo from his backyard. “It’s an exciting time for avionics,” he said. Jamie Mitchell, flight coordinator for the tour, said she’s seen how children begin to grasp the importance of the history of World War II through these hands-on experiences. And she’s witnessed World War II veterans whose memories blossomed after climbing aboard an old B-17. Close, who later became a doctor, was an 8-year-old boy when the attack on Pearl Harbor woke America, the “sleeping giant,” from its slumber. Those were dark times early in the war, he recalled. “Everyone in America made a commitment,” he said. And everyone made sacrifices. “These planes represented the commitment we made as a nation,” he said.